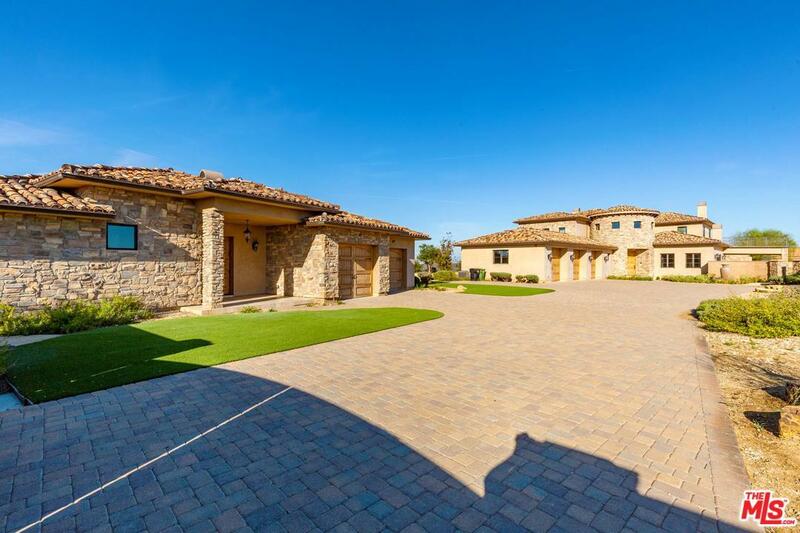 Perched in the hills yet minutes to Calabasas, Topanga and the beach, this newly built Tuscan estate is situated on over 10 acres with panoramic ocean, canyon, and mountain views. The home includes two family rooms, four fireplaces, study, solid walnut and stone floors, soaring beam ceilings, and a spacious master suite with dual walk-in closets, egg bathtub, stone shower, fireplace, sitting room, and romantic terrace with views to Catalina. All of the bedrooms are en-suite with full bathrooms and walk-in closets. The high-end kitchen includes double Wolf range, large marble center island, wine fridge, and SubZero appliances. A detached one-bedroom guest home includes a fireplace and an attached two-car garage, and the main home has a three-car garage. Beautiful yard and gardens with covered Veranda, outdoor kitchen, and barbecue area. Listing provided courtesy of Sandro Dazzan DRE#01418033 of The Agency and Irene Dazzan-Palmer CA DRE# 00597226 of Coldwell Banker Residential Brokerage.